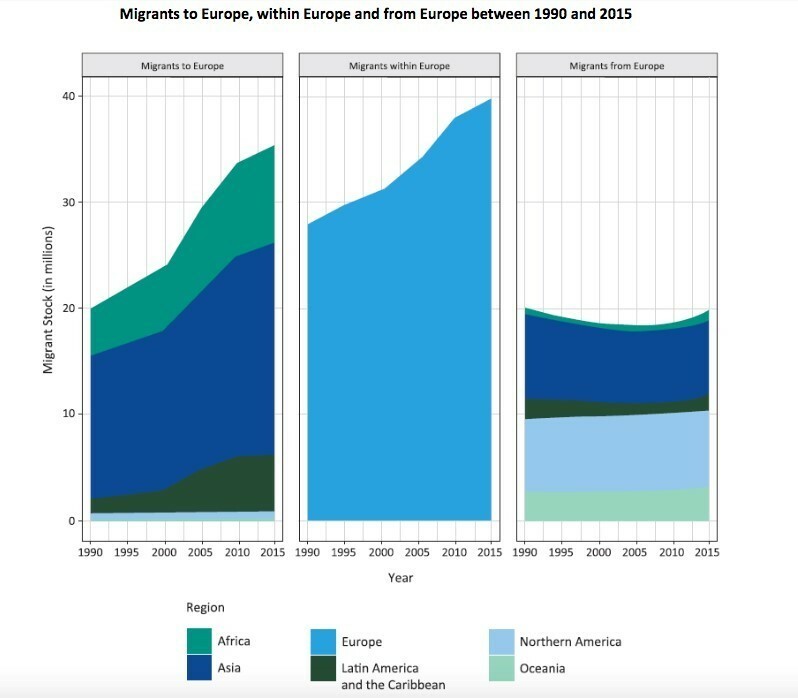 These charts highlight how migration is shaping our world currently and the effect it had in the past. Migration and economic success stories often go together. The millions of migrants who flooded through New York’s Ellis Island in the early 20th century helped turn the city and America into an economic powerhouse. Migration across the British Empire was central to its success at the heart of the Industrial Revolution. And many of the world’s most high-profile entrepreneurs have hailed from migrant backgrounds: Steve Jobs’ father was a migrant from Syria; Tesla founder Elon Musk was born and raised in South Africa, before moving to North America to study in Canada and the United States. 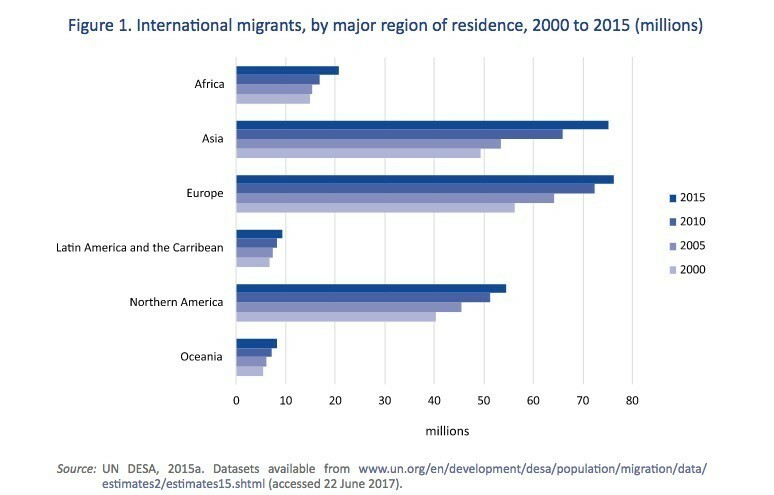 However, while economic migration still accounts for the majority of movement across the globe, a swathe of non-economic pressures have pushed migration to the centre of media coverage and current political debate. The civil war in Syria, conflicts in Africa and natural disasters across the globe have forced millions to flee the land of their birth. The IOM’s World Migration Report 2018 details the nature of both legal and illegal migration in the world today. Here are nine charts that tell you everything you need to know about global migration, taken from the highlights of the report. 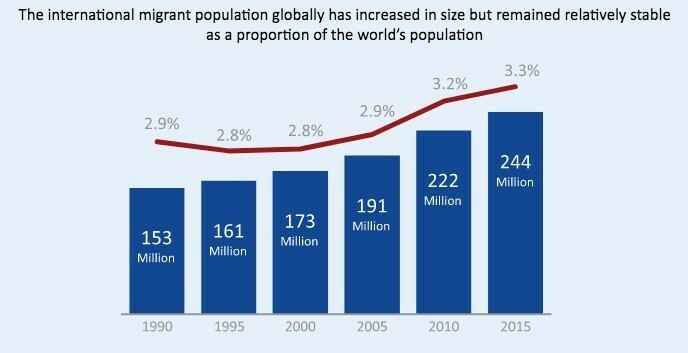 While the total number of people migrating globally has increased by nearly two thirds over the past 25 years, these numbers as a proportion of the total global population have remained relatively stable – at around 3%. Despite high-profile coverage of child refugees from places like Syria, the data shows that most migrants are of working age. This reflects the fact that the majority of migration is for economic reasons. 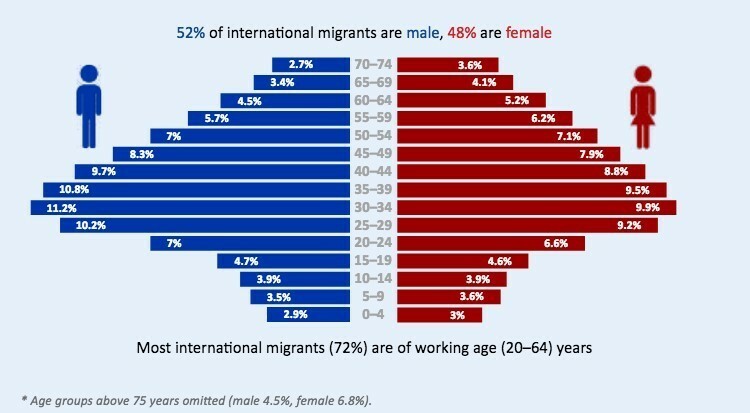 The gender split among migrants is broadly the same as the gender split of the global population as a whole. Europe is currently the world’s number one destination for migrants. As of 2015 there were 75 million migrants in Europe – one third of the world’s migrant population. More than half of these – 40 million – are Europeans themselves, taking advantage of the EU’s open border policy to move throughout the region. Migrants to Europe are primarily those travelling northwest from Asia (which under the IOM’s definition includes Turkey and the Middle East), and north from Africa. While migrants moving into Europe are fewer than those Europeans moving within the region, they still accounted for some 35 million in 2015. Russia hosts the most migrants in Europe overall: 11.6 million, most of whom are from former Soviet states. 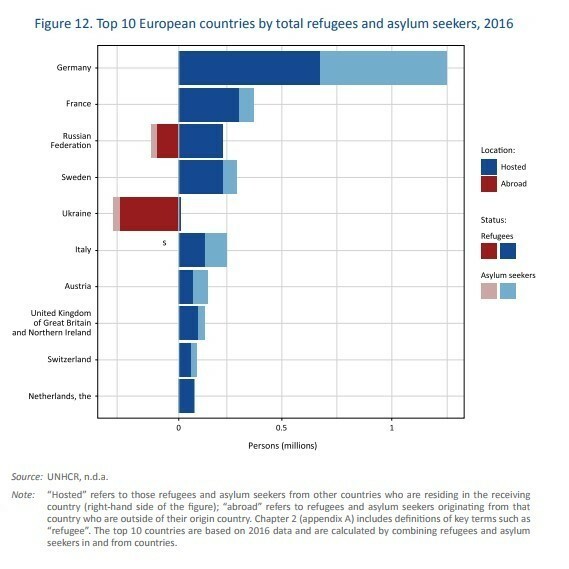 While Russia is the European nation to host the most migrants overall, Germany is the top destination for refugees and asylum seekers. Germany received more new asylum applications than any country on the planet in 2016, with most claims made by people from the Syrian Arab Republic, Iraq and Afghanistan. 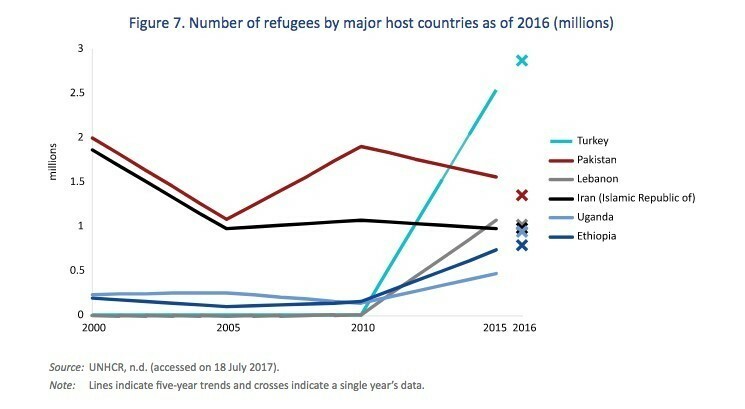 France hosted the second highest number of refugees and asylum seekers in 2016, with large populations of migrants from Russia, Sri Lanka and the Democratic Republic of the Congo. There are currently more refugees on the planet than at any time in history. Of the world’s 22.5 million refugees at the end of 2016, 5.5 million were Syrians fleeing the civil war in their country. The instability and violence that have made Afghanistan a major source of refugees for over 30 years has continued, with the country being the second top origin country in the world with 2.5 million refugees. 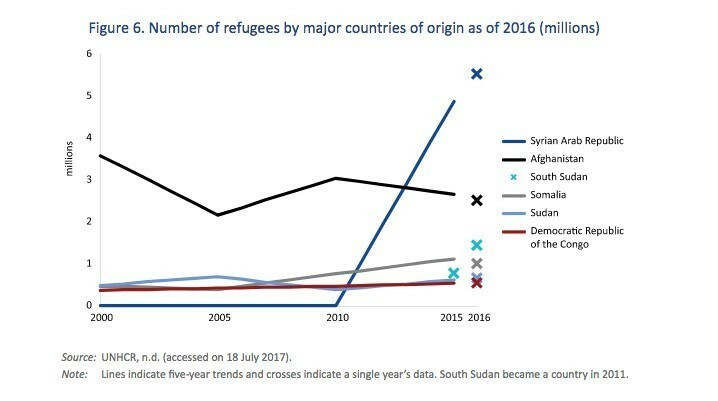 And large-scale violence that erupted in South Sudan in the middle of 2016 saw it become the third largest origin country for refugees, with over 1.4 million at the end of the year. As Syria’s northwestern neighbour, the influx of refugees to Turkey almost mirrors the exodus of people from the war-torn Arab state. In 2016, for the third consecutive year, Turkey was the largest host country in the world, with 2.9 million refugees, predominantly Syrians (2.8 million). Reflecting the significant share of Syrians in the global refugee population, two other bordering countries – Jordan and Lebanon – also featured among the top 10. Pakistan and the Islamic Republic of Iran were also among the top refugee-hosting countries, as the two principal hosts of refugees from Afghanistan, the second largest origin country. While Turkey hosts more refugees than any country on the planet, when it comes to immigration overall it is a relative minnow when compared to some Asian nations – reflecting the fact in general most migrants move for economic reasons. India’s fast-growing economy is drawing a large number of people into the country, although there are still more people leaving the country than entering it. The oil-rich economies of Saudi Arabia and the United Arab Emirates have the largest number of immigrants in the Middle East and Asia in terms of total numbers. Gulf states in general have the highest proportion of immigrants. In 2015, migrants accounted for 88% of the population in United Arab Emirates, 76% in Qatar, 74% in Kuwait and 51% in Bahrain. 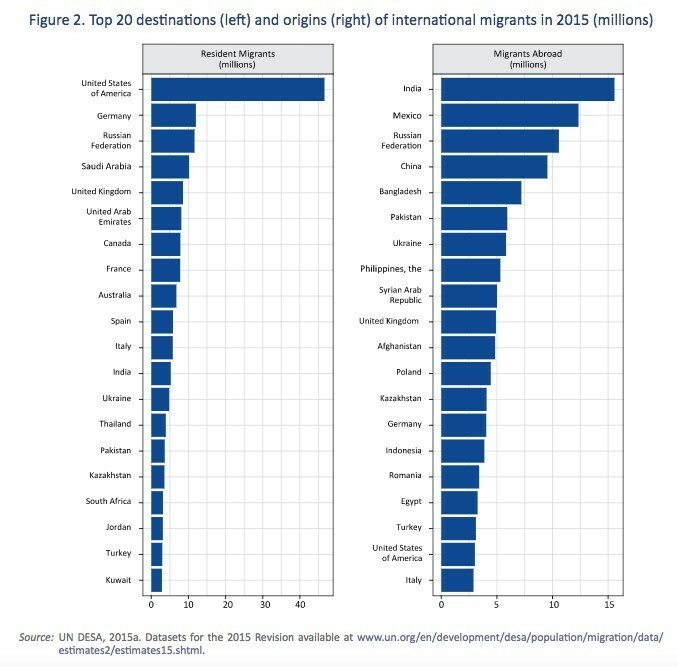 The world’s biggest economy, the US, is also the world’s top migrant destination. In fact, it has been the main country of destination for international migrants since 1970. Since then, the number of foreign-born people residing in the country has almost quadrupled – from less than 12 million in 1970 to 46.6 million in 2015. One of the primary sources of migration to the US is Mexico, which has the world’s second highest number citizens living abroad. 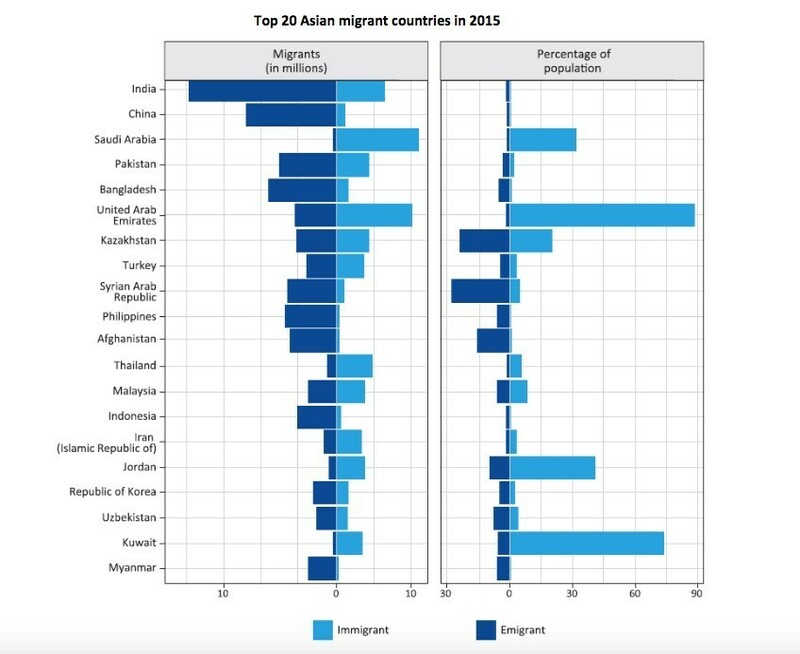 Nearly half of all international migrants worldwide in 2015 were born in Asia, primarily originating from India, China, and other South Asian countries such as Afghanistan, Bangladesh and Pakistan.